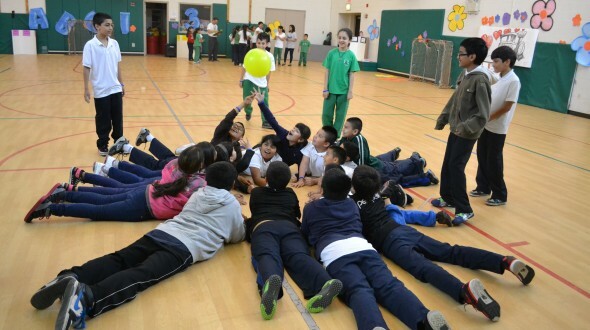 To wrap up the end of the school year, each Play with Potential school created a variation on the theme of “Field Day.” At Otis, students raced around the school, trying to beat their teacher, a marathon runner. At Tarkington, a classic field day will give kids a lot of time outside playing games of all kinds. At Daley, a carnival atmosphere will dominate the scene, complete with a dunk tank for the principal. But at Greene, students who had worked on their leadership skills all year would participate in Leadership Day. Greene’s Play with Potential recess supervisors had been using a positive behavior incentive program called Links for Leadership, in which classes would earn links for playing hard and respectfully at recess. School-wide, the classes at Greene earned over 1500 links, earning the opportunity for a final challenge in Leadership Day. Tasked completing ten different teamwork and leadership challenges, the whole school was divided into eight teams, each with a color and animal to represent them. Armed with a sense of purpose and sweet wristbands from Urban Initiatives, the students worked together in the Hula Hoop Race, the Lava Cross, and other challenging games. While each game had a different angle, they all required students to be positive, work together, and listen very carefully. Throughout the day, all 620 students at Greene got to try their hand at the challenges. Given their time frame, none of the groups could get through all of the challenges by themselves, but, as a team, they were able to beat all of the challenges. Now, the phrase “Together Everyone Achieves More” is definitely clear to the students at Greene. In the end, the Brown Bears took home the Leadership Day championship, but each student received a fun and valuable experience that showed them the power of teamwork. Play with Potential, in its flexibility with the needs and personality of each school, can take great advantage of learning opportunities like this one. Big thanks to Greene school for becoming our partner in grooming the leaders of the future.